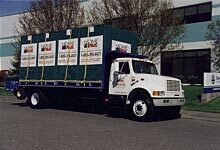 Portable storage is an innovative storage method that has evolved into a concept that has won substantial public acceptance. If you are looking for the utmost in convenience and safety for your belongings that require storage, read on. Has anyone ever had enough storage space? Even if you have enough room to accommodate the everyday clutter, what about the special situations? Things you don't need right now, but may need later. Things you don't want to use, but can't bear to lose. There are as many short-term and long-term storage crises as there are people with goods to store. For easy, convenient, economical storage for home or office use, call for delivery of a revolutionary HomePak by Eagle Transfer Company storage container. It's the next best thing to having a private warehouse right outside your door. The Easiest Way Ever to Pack and Store! 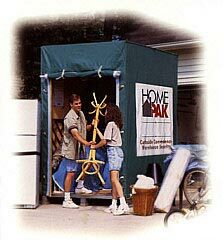 copy; Copyright 2002 HomePak Storage.